Thursday was the big seminar day. My last few months of teaching have meant that I have become more and more adept at lecturing last minute, and I was pleased to talk to some of the other Fulbrighters and realize that I was not the only one who had decided to put together their presentation at the eleventh hour. As you can see, we are quite the diverse group of scholars, researchers, and teachers. Thankfully the organizer of the seminar, Rena, decided to put the sciences at the beginning of the seminar, stating that she would be better engaged with the more complex topics earlier in the morning. I happen to completely agree with her. By the time we got through the Brain Matter topic I had completely lost the thread of the scientific conversation and simply contented myself with reflecting back on the days when I actually remembered high school biology. Drumlins: my nonscientific explanation of a drumlin is that it is an ovular hill that is formed by glaciers. Nobody fully understands how they are formed (which is the object of this Fulbrighter’s research), but they have some really interesting implications for climate change. Apparently one of the biggest causes for rising sea levels is NOT the melting of glaciers, rather it is the speed at which glaciers are falling into the ocean. Drumlins play a role in that they can act as speed bumps for glaciers and thus slow down their movement into the sea. Human Brain Size: This Fulbrighter aims to learn more about why humans have such big and complex brains. Apparently prior research has only targeted single explanations (food, communities, etc.) but this Fulbrighter wants to develop an explanation that addresses multiple causes for increased brain size. Race and Ethnicity: One Fulbrighter is both teaching a class on race and ethnicity at the University of Oslo, and is also looking at how the two things are viewed in Norway. Interestingly enough, she has noted that there isn’t really a dialogue around race in Norway and that the Norwegian government makes no effort to track race or ethnicity, unlike say the U.S. census. Digital Media: One scholar is looking at e-literature and explained how there can be vast differences in the preservation of e-literature versus classic printed literature. One of the biggest challenges is that changes in software make certain kinds of e-literature near obsolete since the programs or software systems that they run on are no longer in use. Lower Secondary School Roving: I really enjoyed listening to the roving scholar that teaches at the lower secondary school (middle school – high school) level. One thing that I really liked about her presentation was the difference between how outsiders might view the schools versus the way the communities viewed the schools. Having traveled to a variety of locations, some of which are very remote, she commented that most schools have some piece of artwork in the lobby that highlights the way that the students and teachers view the schools. Oftentimes the artwork presents the school as more bustling and friendly than it might appear to be at first glance. I myself was in the last group with the two upper secondary school roving scholars. Our topic was quite broad so the three of us talked about a variety of things. The two rovers addressed the lack of participation in Norwegian schools, the role of teachers in the classroom, and the connection between child poverty and education. I decided to look more at student motivation, school structure, and homework. 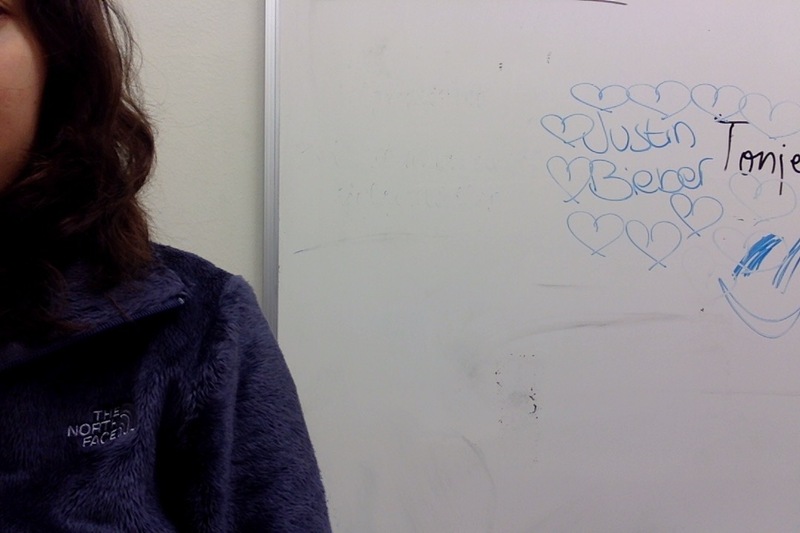 I was even able to talk briefly about my students’ obsession with Justin Bieber. No, I’m not kidding. One Direction is the runner up when it comes to being the heartthrob of choice amongst my Norwegian teenagers, but Justin Bieber seems to be the true ruler of their hearts. The proof is all on my morning whiteboard. One huge difference that I see in U.S. students versus Norwegian students is their attitude towards university. When I went to high school everyone was incredibly motivated to do well in order to get into their school of choice and to qualify for things like scholarships. My Norwegian students on the other hand don’t really seem to worry about going to university. They are almost guaranteed a place at a university and the bigger question is which university they are going to go to. Additionally, university is free for them. Furthermore, because U.S. universities place a great focus on having well rounded students, or Renaissance men and women, I found that there is a much greater focus on breadth instead of depth. Students are typically in class for around an hour, which allows them to take a variety of classes. Additionally, they can choose to be in more difficult classes if they wish, such as honors or AP level courses. In Norway, the shortest class period that I’ve worked with is 90 minutes and the longest is four hours. There are no options for honors or higher level courses, and it is actually illegal to have them, unless your school has a workaround with an IB program. In short, Norway has a greater focus on depth instead of breadth. Another difference is that U.S. high schools have a variety of extracurricular activities that you can immerse yourself in. In fact, participation in these is encouraged partially because it is a huge component of the college application process. In Norway, extracurricular activities are unconnected with the school and are never asked for as a part of the university application process. Thus, students don’t seem to really be involved in any after school activities. Overall, feedback systems and major projects tend to be lacking. I was talking to some of the other ETAs and we were speculating that the reason why so many Norwegian students struggle with writing at the university level is because they only write about five essays during their entire high school career. I concluded by saying that while the U.S. might have a more rigorous curriculum, it can also be a bit more competitive. In contrast, Norway has a greater focus on depth in their education system and the students are more relaxed. Both systems have their pros and cons and hopefully we will get an education system somewhere in between the two. During the Q&A I was asked by an embassy official whether or not I thought the more relaxed attitude of Norwegian students is related to the comprehensive welfare system that exists in Norway. Funnily enough I have talked to some of my co-teachers about this very question and I think that the answer is yes. In the United States higher education is much more closely linked with better jobs and financial security than it is in Norway, and I believe that this helps push American students to perform. In Norway, my students don’t have to worry about falling through the cracks, and even if they do, they have a good safety net to catch them. The welfare system in Norway provides for its citizens in many ways, and one of the biggest ways is that it helps alleviate the worries associated with poverty. It’s possible for my students to leave school and still do very well in Norwegian society without higher education. And while that is truly a wonderful thing, it also does seem to affect classroom performance. Many of my co-teachers have said that students are much less focused or driven than the students they’ve had in previous years, or when Norway was a poorer country. BUT the seminar was not all that we did on Thursday. Once we were done, we made our way to the U.S. ambassador’s residence. The way was slippery and my shoes were not the best for sliding on ice (one Fulbrighter took so much pity on me that he offered me a piggyback ride), but we all made it to the residence in one piece. We had a great time mingling with the various guests, listening to the final two Fulbright presentations, and of course eating. Currently the U.S. doesn’t have a Norwegian ambassador, but the flip side of that is that the chef was quite excited to have someone to cook for. I have to admit, he really outdid himself. The dinner was scrumptious. I did get a bit held up though when after grabbing a plate of food I was drawn into conversation with an embassy official. Luckily he noticed after a while that my hand carrying my very full plate of food was beginning to shake and let me run off and eat. I would clearly make a terrible waitress. I do have to say though that the culinary highlight was dessert, entitled “The World’s Best Cake.” Now with a name like that you both have to eat the cake and be skeptical of it. It was in fact pretty fabulous. It was covered with meringue on the base and the top, as well as slathered with cream. In fact, I don’t know anyone who didn’t go back for seconds. I even asked someone at the embassy if they could get me the recipe. But we couldn’t stay at the residence indefinitely. Having boozed and schmoozed for several hours, all that was left for us to do was to return back to the hotel and dream of skiing in the morning. *Interestingly enough you can pretty much generalize across Norwegian schools. Many of the schools are very homogenous in terms of curriculum. Abby, the Bergen ETA, and I teach the same course and use the same materials even though we’re in different cities and counties.